A newspaper reporter crosses the paths of many people in a lifetime. They come in many different ranges from the good to the bad and the ugly. Audie Murphy was one of the good ones. I was working as a court reporter for the Los Angeles Herald-Examiner in 1970 when I met Murphy. The Burbank Police had charged him with assault and battery for pistol-whipping a dog trainer named David Goffstein after the trainer had insulted his girl friend. Murphy was represented by attorney Paul Caruso and my editor Tom Caton assigned me to cover the trial. 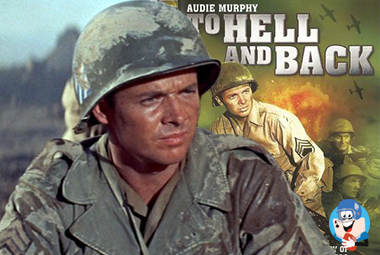 I knew all about Audie from the many western movies he had made, including a World War 2 epic called 'To Hell and Back' in which Audie played himself. Audie was a war hero. The U.S. Army referred to him as 'the most decorated American soldier of World War 2' and said he won every medal for valor the federal government could give him, including three Purple Hearts and the Congressional Medal of Honor. As a combat infantryman in the 3rd Infantry, he killed nearly 250 enemy soldiers in intense combat. That led him to write his autobiography, 'To Hell And Back,' which was made into a movie starring Audie as himself. I did some research on Murphy and discovered he was born in Hunt County, Tex. on June 20, 1924. He was the seventh of 10 children and his father was a sharecropper who abandoned the family when Audie turned 12. Audie dropped out of school to put food on the table. He pulled cotton and armed with a .22 rifle -- he was a crack shot with a gun as well as with a slingshot -- he killed rabbits and other small game to feed his family. He was 16 when his mother passed away. His siblings became wards of the court and went to live with relatives or in an orphanage. When the Japanese bombed Pearl Harbor, Audie lied about his age and tried to join the Marines. He was only five-foot-five and weighed 130 pounds. The Marines rejected him because he was too small. He attempted to join the Paratroopers and they turned him down. In desperation, he tried to enlist in the Army and was accepted. By the war's end he had been promoted from Private to Commanding Officer. Because of his heroism under fire, Life Magazine featured him on its cover in September 1945. Actor James Cagney saw the photo, read the story and invited him to Hollywood. He accepted Cagney's invitation and slept in a Hollywood gymnasium while he waited for producers to offer him a job. After his honorable discharge from the Army, Murphy suffered what was then called combat fatigue but is now referred to as post traumatic stress disorder. This led to insomnia, stress and a hair-trigger temper. He would wake up in the middle of the night, grab the pistol he kept beneath his pillow and fire several shots before realizing where he was. While working on movie sets, he actually threatened to kill a couple of people, including film tycoon Howard Hughes. When I met Murphy in Los Angeles County Superior Court, he had made over 40 movies, most of them westerns. He was still baby-faced, had a good smile, gave me a firm handshake and thanked me for covering his trial. Caruso, a cigar-smoking attorney who was well known for representing movie stars, said he was confident the jury of nine women and three men would acquit his client. He was right. The jury took less than two hours to find Audie innocent of the charges against him. Audie was not only the most decorated hero of World War 2. He was a gambler. After the jury came in with the acquittal, Audie thanked me for my fair coverage. Caruso lit a cigar and smiled. 'Here's a tip for you,' he told me. 'If you want to become a celebrated Hollywood attorney, find a client who makes the jurors want his autograph.' We laughed and Audie just smiled. Several months after the trial, Audie and several investors were flying in a private aircraft on a business deal when they ran into fog and inclement weather. The plane crashed into a mountain near Roanoke, VA., killing everyone aboard. 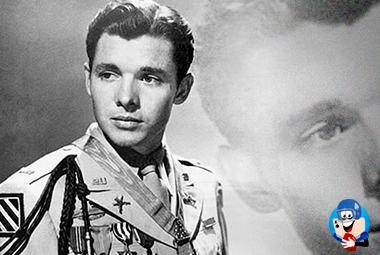 Audie Murphy was buried with full military honors at Arlington National Ceremony. 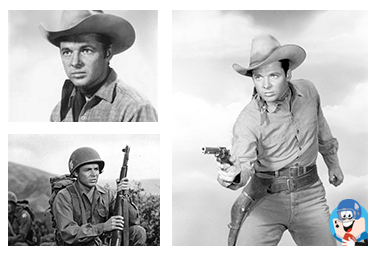 In 1996, the Texas State Legislature declared June 20 as Audie Murphy Day. On Oct. 29, 2013, Texas Gov. Rick Perry posthumously awarded Murphy the Texas Legislative Medal of Honor.